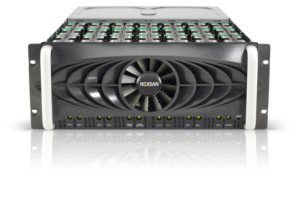 Nexsan’s SASBeast® is a high-capacity, high-performance, enterprise-class storage disk system ideally suited for transactional functions which demand high I/O per second. With its storage capacity of 25.2TB offered in 4U of rack space, SASBeast is scalable to hundreds of terabytes of capacity in 1U. Utilizing 42 high-speed SAS drives, it’s ideally for customers whose systems support Microsoft Exchange, Oracle, SQL and similar databases, as well as those employing large file servers, virtual server surroundings or large amounts of smaller files. Equally important, SASBeast comes with FC and iSCSI connectivity allowing customers to combine SAS, SSD and SATA drives within the same solution to address different functional requirements. By utilizing the latest SAS technology, SASBeast achieves enterprise-level, tier-one performance. SASBeast also takes advantage of Nexsan’s built-in cost advantages, which enable it to deliver tier-one performance at mid-market system prices. When utilizing the latest 8Gbit fiber channel controller, SASBeast is scalable to 102 disks by adding the Nexsan E60X 60 disks expansion chassis. As with all Nexsan systems, SASBeast is engineered for enterprise-class applications, utilizing tier-1 redundancy and performance delivered with tier-2 prices. It’s simple to install and use. And SASBeast comes with technologies that are highly dense, space efficient and cost-effective and Nexsan’s AutoMAID (Massive Array of Idle Disks) level 3 energy-saving technologies, allows SASBeast up to 60% in energy costs savings.